서도소리는 황해도와 평안도 지방(서도지역)에서 전승되던 민요나 잡가 등을 말하며, 언제부터 부르기 시작하였는지 정확한 시기는 알 수 없다. 서도소리는 평안도 민요와 황해도 민요, 서도잡가, 한시를 읊은 시창(詩唱)과 극적 구성을 띠고 있는 배뱅이굿이 있다. 평안도 민요에는 수심가, 엮음수심가, 긴아리, 자진아리, 안주애원성 등이 있는데, 조선 전기부터 서도지방 사람들의 벼슬길이 막히자 그 설움을 푸념으로 읊은 수심가가 가장 유명하다. 평안도 소리는 일반적으로 레, 미, 솔, 라, 도의 다섯 음으로 구성되어 있는데, 떠는 음인 ‘라’에서 완전 5도 내려가는 것으로 선율의 골격을 이루고 있다. 대체로 사설이 길며 장단도 일정하지 않아 적당히 사설에 맞추어 치는 것이 특징이다. 황해도 민요에는 긴난봉가, 자진난봉가, 병신난봉가, 사설난봉가, 산염불, 자진염불, 몽금포타령 등이 있는데 난봉가와 산염불이 유명하다. 황해도 소리는 평안도 소리와 함께 서도소리의 일반적인 선율형태를 나타내고 있으나 그 선율진행에 있어서는 조금 다르다. 또한 평안도 민요에 비하여 일정한 장단을 가지고 있으며, 밝고 서정적이다. 서도잡가는 서도입창에 반대되는 말로서 앉아서 부르는 소리이며, 공명가, 사설공명가, 초한가, 제전, 추풍감별곡 등이 있는데 이 중 공명가가 유명하다. 서도잡가는 긴 사설을 가지고 있으며, 장단은 노래말의 자수에 따라 불규칙적이다. 끝을 여밀 때는 반드시 수심가조로 끝나는 공통점이 있다. 서도소리의 가락은 흔히 수심가토리라고 하여 대개 위에서부터 질러내며, 위의 음은 흘려 내리고, 가운데 음은 심하게 떨며, 아래의 음은 곧게 뻗는 특이한 선율 진행을 보여주고 있어서 이들 소리를 느긋하게 부르면 구슬픈 느낌을 주게 된다. 서도소리 창법은 좀 특이한데 속청과 본청이 있어서 속청은 속소리로 당겨서 직선타법으로 잘게 떠는 소리, 본청 같은 경우 두성과 뒷덜미로 당겨서 음을 사용하는 것이 특징이다. 서도소리는 예로부터 대륙과 인접한 거친 풍토에서 북방 이민족과 함께 겨루며 굳세게 살아온 서도지방민들의 생활속에서 면면이 이어져 내려온 소리로, 노랫가락에도 그들의 생활감정이 잘 드러나 있다. 현재 국가무형문화재로 지정된 세부 기·예능에는 수심가, 관산융마, 배뱅이굿이 있다. 배뱅이굿은 흔히 남도의 판소리와 비교되는 음악으로, 한 사람의 소리꾼이 장구 반주에 맞춰 배뱅이 이야기를 서도의 기본 음악 어법을 바탕으로 민요와 무가, 재담 등을 섞어 해학적으로 엮어낸다. 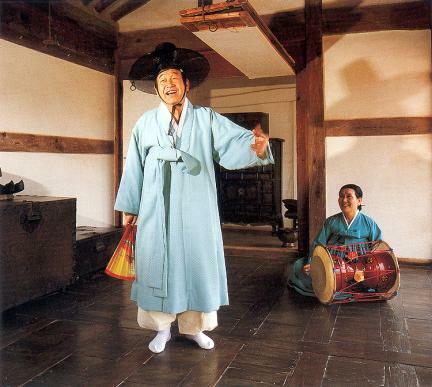 Seodo Sori refers to folk songs handed down in Seodo, i.e., Hwanghae-do and Pyeongan-do. 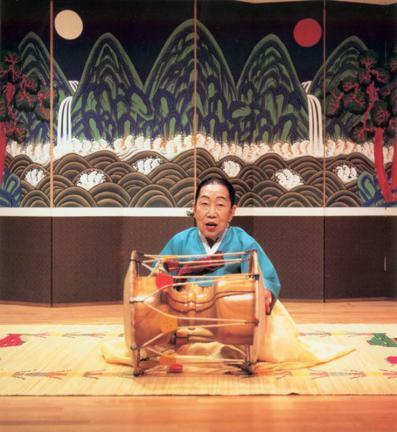 Seodo Sori is divided into folk songs of Hwanghae-do and Pyeongan-do, Seodo Japga (Miscellaneous Songs of Seodo), and Sichang (chanting of Chinese classics). Folk songs of Pyeongan-do include Susimga, Yeokkeum Susimga, Ginari, Jajinari, Anju Aewonseong, etc. The most famous one is Susimga (Song of Sadness), which displays the sad mind of the people in Seodo because of their difficulties of being hired as a high government official in the early Joseon Period. 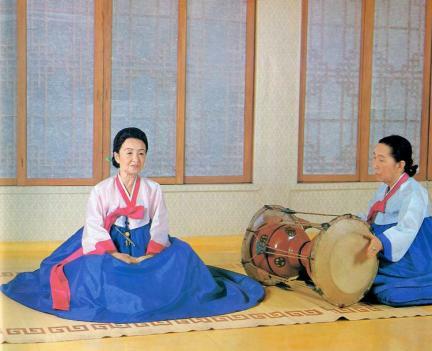 Folk songs of Pyeongan-do are generally composed of five notes: re, mi, sol, la, and do. Generally, the narration is long, and the rhythms are irregular. The accompanying drum is beaten at the drummer’s discretion. Folk songs of Hwanghae-do include Gin Nanbongga, Jajin Nanbongga, Byeongsin Nanbongga, Saseol Nanbongga, San Yeombul, Jajin Yeombul, Monggeumpo Taryeong, etc. Compared to those of Pyeongan-do, folk songs of Hwanghae-do display regularity in rhythms in addition to being bright and lyrical. 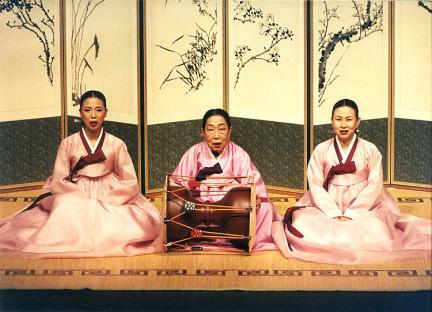 Seodo Japga are songs sung by seated singers. They include Gongmyeongga, Saseol Gongmyeongga, Chohanga, Jejeon, and Chupunggam Byeolgok, although Gongmyeongga (Song of Kong Ming) is the most famous among them. Seodo Sori are songs that have been handed down by people who had to struggle persistently with the northern tribes in Manchuria to survive. Their melodies contain the sentiment of such people. Songs like Susimga, Gwansanyungma, and Baebaengigut have been designated as important intangible cultural heritages. Gwansanyungma is based on a poem of Du Fu, a poet of the Tang Dynasty, China, lamenting his being unable to return home due to rebellion. Baebaengigut, which is often compared to the pansori (epic chant) of the southern provinces, is a story about Baebaengi (a maid who died young) as told humorously by a singer who mixes folk songs with gags and dances.